The first National Championship of the Republic of Moldova was held on March 11, in the capital of the country, Chisinau city. The event took place in the sports complex of the State University of Physical Education and Sports. Total 95 athletes from 15 clubs were registered. Taking into account the fact that juniors and veterans could take part in seniors, there were 119 participants at the start on the left hand, and on the right - 126. All major cities, 23 of the 32 districts of our small country were represented; unfortunately, there were no representatives of the Transnistrian region. Proceeding from the fact that the number of participants was not great, the organizers decided not to comply with all categories provided for in the international championships (Europeans, worlds), but to connect them in such a way that there was a place for the fight. Thus, for example, among the seniors, the category step was 10 kg (60 kg, 70 kg, 80 kg, 90 kg, 100 kg, and +100 kg). In total, 6 competition classes were organized (for persons with disabilities: standing and visual, juniors, youth, masters, seniors men and women), total 38 categories. The fight took place at two competition tables, the referee panel was represented by six referees with international qualifications (2 from Moldova and 4 from Romania), and technical assistance was also provided by EAF and WAF General Secretary Mircea Simionescu-Simicel and WAF Office Assistant Angelina Sinabova. Among sportsmen with disabilities, I want to mention the winner in the class of wrestlers with visual impairment - Vladimir Butuch, who later became a bronze medalist in the category of senior 90kg, on the left hand. Despite not too big experience of juniors and youth, there were interesting and technical fights. Among the juniors, the most spectacular was Mihai Kumpanich, who easily won his junior category + 75kg both on left and right hands. The winners of the youth categories (Shoshev Ivan, Stoyanov Oleg, Butmalai Viktor and Costeniuc Tudor) later became prizewinners among senior men. Among women, Mihaela Lazar was confidently victorious in the category and absolute superiority. It is worth noting that in the final match she fought with Natalia Shkuratkova, who weighs less than 50 kg and gave birth just a couple of months ago, thus being an excellent example and motivation! 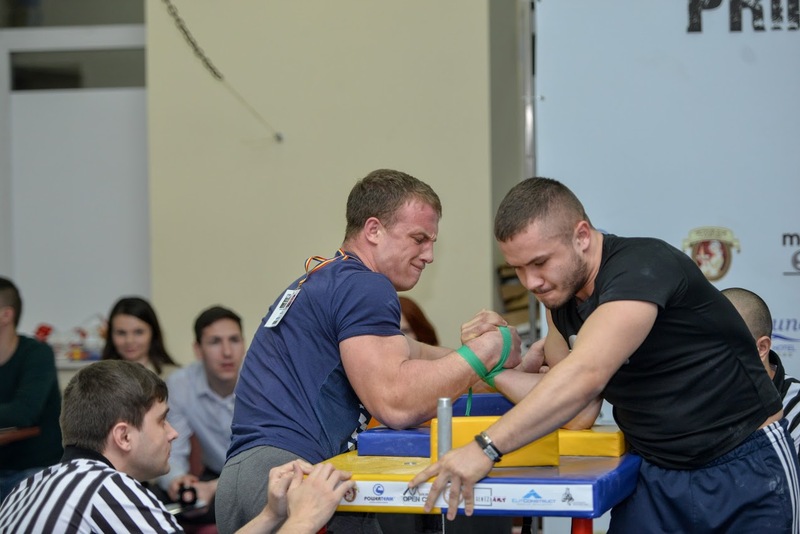 Among the clubs - the first place on points was taken by the team representing the arm-wrestling club USMP (State University of Medicine and Pharmacy). I want to note the fact that, thanks to the personal efforts of the President of the Moldovan Federation of Armwrestling Marcel Darie, the whole event was broadcasted live on the national sports channel MOLDOVASPORT TV. Based on the results recorded in the National Championship, a team of 10 to 12 athletes will definitely participate in the European Championship.